An opportunity workshop is a way to quickly assess what work needs to be done to improve the user experience, what’s highest priority from a business perspective, and what will have the most impact from a user perspective. Use an opportunity workshop when you find yourself having general discussions about the need for an improved user experience, but there is no clear momentum or sense of how to get there. Block off at least two hours on the calendar and invite together a cross-functional team of people who all work on the product. State the goals of the work session. One-by-one, ask people to share their Post-it notes, and put them on the wall where others can see them. 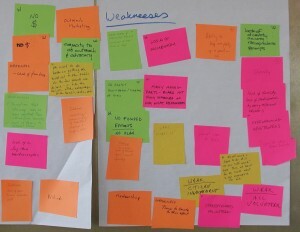 Next, ask the team to write down the product’s strengths—again, one strength per sticky note, as shown in Figure 5.9. It’s useful to follow problem areas with strengths so that the team ends on a positive note, even if the overall discussion may have been constructively critical. Next, guide the team in an activity to organize the issues that were identified into related groupings. Once some clear groups begin to emerge, ask the team to label each group. Put the label on another sticky note (preferably of a different size or color, so it stands out from the other Post-its) so everyone can easily stand back and see the issues and opportunities as broad themes. Now, lead the team in a prioritization exercise. This could just be a discussion. Or, to make it more structured, give everyone a certain number of votes, and ask them to put their votes next to the clusters that they think are most urgent to address, improve, or enhance. Once the priorities have been clearly identified, lead the group in a discussion about how urgently these should be addressed, and how you’d like to address them. What’s YOUR favorite way to assess how to improve a product’s UX? Post your reply as a comment below by Tuesday, 11/12, midnight PT. The best reply wins a free copy of The User Experience Team of One. I’m personally fond of doing one-on-one observations and conversations with people. Although I my original answer would have also been an opportunity workshop, we called them Inceptions or visioning sessions. They follow a similar format to the opportunity workshops, with a few very important differences. I would suggest a couple days. There is nothing worse then not having enough time to share your opinion. This is a room full of stakeholder, everyone should be able to share their thoughts! 2. [State the goals of the work session.] OR what if we don’t know the goals? Meaning, we know there is a problem/project we want to discover BUT, we don’t know exactly what that is? During this portion, even if we “know” the goals I would take a step backwards and brainstorm. Have every team member write down 3 goals that they have for the session and then aggregate those goals as a group activity. Once aggregated, discuss them. If the room doesn’t like the three most popular goals aggregated then let them vote on the ones they want. When the goals are decided then the structure of the session can be decided. I would remove this portion. I think at every company, we know the internal needs. Meaning product owners are clear about what they want and business is also very vocal at this step. I believe this session should be used to learn about our users. Therefore in step 3, I would use the time to identify our personas. Together as a group I would ask the room to shout out the personas of the product. I would use ThoughtWorks methods to gain this information from the participants then I would split the group into smaller groups that have different roles on each team. Then I would assign each team a persona. 4. In step each team will ‘bake out’ their persona with information that they know about their users OR information that is assumed. I.e. lifestyle, income, education etc. I would then ask the groups to present their personas to the rest of the room. Steps 5-… whatever it takes, to identify the solution to the problems that were derived from the goals, should be used to thoroughly investigate those problems/solutions. Very often, we arrive at a solution and then come to find that there wasn’t a problem to begin with. I believe understanding the consumer/ user is the first step to identifying the right problem. This provides a sense of common understanding for the team, and a level of empathy needed to address the correct needs. The methods used following the persona exercise are activities to guide the group to a narrow solution resulting in a project solving a problem/ set of problems for the user. Workshops are powerful as long they engage all parties in the room, teach something new to every individual involved and most importantly result in a powerful action item for the company. It has to be the classic guerrilla usability test. Head to your nearest coffee shop and bribe people to interact with the product, film or take notes, rinse, repeat! Not the most original but highly effective. I like doing user research out in the field, literally in the clients offices that way I can see how they use features in their natural environment! Raw unbiased real time observations. Use an evernote journal to collate research (Hat tip to Mailchimp for the recommendation) from any source—surveys, interviews, usability tests, customer feedback, shadow studies, any research, guerilla or formal. 1. Each sprint cycle go through all of the new feedback looking for patterns. Look for underlying motivations rather than direct assessments. Collate the feedback—use stickies and a whiteboard. 2. Prioritize all of the feedback based on its’ recurrence. Reprioritize based on the product vision. 4. Go and get feedback, using whatever UX studies are most pertinent and pragmatic. Evernote gives you a historical view of the feedback and updating a whiteboard with stickies means that over time you keep the important and let the unimportant go. It helps you to be mindful of what did not work in context of what did work. Talk with everybody, and keep on talking back and forth. Talk to users, but also product managers and developers. Include them all once you have a first design, and iterate, iterate, iterate. Just put it in the hands of a real end user, preferably in realistic context. It never fails to surprise me what people have to say and what they do. I cannot and should not expect to be able to pre-empt (at least completely) what users think or need, no matter how convenient it would be! Go into this process prepared, with a clear vision of what you want to find out before hand, but of course being open to straying off the path when something interesting happens. Uncovering latent needs requires observation and probing, with indepth analysis afterwards to tease out the details. I ideally would record everything, with the permission of the user.